Tabletop games (and more recently video games) have a long history of being used for education and development, as well as evaluation and treatment. RPG’s are used to help emotional development and social analysis, abstract and tile-laying games help work with spatial and relational awareness, and cooperative games are great for developing the ability to work in groups. Most kids games are specifically designed to address one or more of these skills. Even the youngest kids can learn how to take turns or work on their dexterity through games. 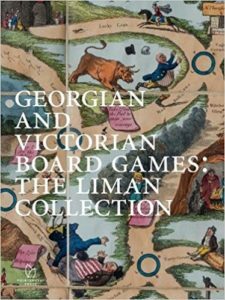 This history of education-by-doing is highlighted in a new book: Georgian and Victorian Board Games: The Liman Collection. The games themselves are to be donated to the Yale Center for British Art, but have been reproduced in full detail in these fold-out pages. We’re working on getting a copy for the cafe! 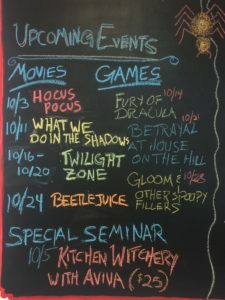 October is a real favorite over here at House Rules – it’s the beginning of truly cool weather (three cheers for flannel season), and, of course, it culminates in Halloween! So we’ve got big plans all month long to spread some spooky spirit. Our schedule of events is below – check out the links to the Facebook event pages to learn more! All the screenings are free, and we’re getting a projector to show them on. We hope to see you at House Rules for one spectacular and spooky October! 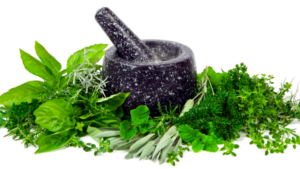 If you’re interested in learning more about herbalism and wellness, come to Aviva’s special Kitchen Witch seminar at House Rules at 5:00 PM on October 5th! Learn more here and buy tickets here, or stop in to the cafe and ask about them. She’s excited to share some hands-on knowledge with our community, and you’ll get to take home the fruits of your labor after the seminar! With cooler weather and colorful leaves comes an almost visceral desire for warmth and comfort. That’s why we’re launching a new fall menu that will cater to both of those things! Stop in to House Rules starting this Friday September 22nd to get a taste of our new menu. 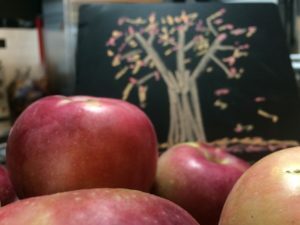 It’ll feature more of all the things that taste best in the fall – grilled cheeses, hot cocoas, mulled cider, soups – everything to make you feel all warm and satisfied in your big comfy sweater. That is, once we get out of these last few weeks of bluebird summer! Grilled Pizza: Our house-made tomato butter with Stracciatella (cream-soaked mozzarella) and fresh basil, sandwiched in a focaccia and grilled. Golden Hot Cocoa: Cocoa with turmeric, honey, and black pepper in milk. Mulled Cider: Heated and spiced to your desire. Porridge: Overnight steel-cut oats with cream, dried fruit, and brown sugar. For Vegans: A toasted couscous cake with roasted veggies. But the menu isn’t the only thing changing around House Rules – soon we’ll be installing cushioned benches along one wall, so you can really get comfy while you eat and play. And, once the really cool weather hits, we’ll have a stockpile of blankets too! For those uninitiated to the world of role playing games, getting started can be a little intimidating. Some people might only know of Dungeons and Dragons – but there are actually a wide variety of RPG systems, and they can be used with all kinds of characters and universes. We think that there are a lot of people who would love tabletop RPGs if they gave them a shot, so we want to make the introduction process a little easier! At 1:00 PM on Saturday, September 16th we’ll be hosting an “Intro to RPGs” session with our friend Stephen Chast. We’ll play a game in the universe of “It’s Not My Fault.” This character and situation generator places you and your friends in increasingly crazy and perilous situations, all blaming each other. We can’t wait to see if art imitates life! The system here is Fate Accelerated, a condensed version of Fate Core. FATE focuses more on role-playing and storytelling, rather than being a numbers-driven system. It’s easy to understand and allows for a quicker game than the full version, so it’s great as a less intimidating intro for new players – but it’s still a fun one-shot for experienced players. This event is sign up only with a five person max, so message, email, or call us soon to save your spot – first come, first served. Just in the last couple days, the geek world has been turned on its head by a statement released by a woman about her male ex-partner, upending everything we thought we knew about feminism in Hollywood. Or not so much. It’s honestly not terribly surprising that the men who are in power, especially in the sci-fi and fantasy media realms, tend to be problematic in regards to women. I’m inclined to think that the clay feet of our nerdy idols is a continued failing of geek culture to recognize the subtle ways in which bigotry is reinforced within our subculture. Don’t get me wrong, we can clearly point to individuals and incidents as being the predominant focal points of bigoted thought. But there is an overall environment which allows all men with power in geek media to get away with gross treatment of anyone other than straight, cissexual, white males, and that’s a problem which needs addressing. Gene Roddenberry, Johnny Depp, and most recently Joss Whedon: all have a history of being vocal advocates for social equality (especially in regards to women), but eventually enough info comes out that they are exposed as exploiters and abusers of their spouses, significant others, and the women they cast for the characters they write. I’m going to try to keep this to just public material, rather than referencing personal matters that may be in dispute. 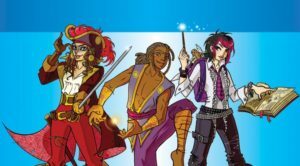 Let’s take a look at the stereotyping and presentation of women in sci-fi and fantasy, using some of Joss’ properties as examples. Buffy is often pointed to as the obvious argument for Joss’ feminism, along with his penchant for writing female characters that appear, on the surface, to be of the “Strong Female Character” trope. Within the details of the story and dialogue, though, he falls into the trap of the male gaze: Any woman considered “desirable” is always model-thin and dressed to the nines, even when relaxing or performing actions that would be incredibly uncomfortable when wearing skirts and heels. The women who are dressed comfortably and practically are either an older generation than the main cast, or pigeonholed as “undesirable” for superficial reasons. As one example, take Kaylee Frye, in Firefly/Serenity. The actress, Jewel Staite, was asked to gain 20 lbs to play the character in the show. The costume designers deliberately played up her frumpiness and provincial style (ex. her dress in “Shindig”) so that she would be a complete contrast to the refined and urbane Simon Tam. This is a long-used tired trope of “romance despite class differences,” frequently seen in Regency-era properties and romantic comedies. His interest in her despite her perceived undesirability becomes the plot point, rather than a natural outcome of character development. You have a strange sense of nobility Captain. You’ll lay a man out for implying I’m a whore but you keep calling me one to my face. Following on the heels of that are the reactions to Inara’s female client in “War Stories,” (“I’ll be in my bunk”) and the overall treatment of Companions within the Firefly universe, where they are reduced to the Madonna/Whore dichotomy. This is especially apparent in the few glimpses we get of their personal ceremonies, which appear to be a highly spiritual ritual, performed while wearing stylized and revealing clothing. This objectification of an entire feminine subset is common in science fiction and fantasy, and is seen in almost every major property (Orions in Star Trek, the women of the Red Room in Avengers/Marvel, most of the female villains in DC, the Twi’lek in Star Wars). Assigning one of the characters from this subset as a romantic foil for the male lead is par for the course. It is a tired and overused trope, and one that turns the female half of the heterosexual relationship into a two-dimensional being, existing only to reflect the attitudes and desires of the male character. She is rarely developed on her own, and then only as an accessory to him, as either part of the exposition of his background or the establishment of him as her savior from an unsavory life. Regarding Joss’ modern properties, one has to only watch The Avengers franchise to note the lack of complex female characters. For a long time, the only women in the Avengers franchise were Freya, Odin’s wife, Natasha Romanoff, a woman who was rescued by Hawkeye from a spy agency where she was trained to become any type of woman, and Pepper Potts, who exists only to be a foil or romantic interest for Tony Stark. Again, all are reduced to their roles as accessories to the male characters. In Civil War, we finally saw another major female character introduced – as a balancing act for the two conflicting groups, so that there was near-perfect symmetry between the sides (a flyer, a person of color, a marksman, a leader, a woman). Wanda Maximoff is less a real character than she is an object to fill a role. Agents of S.H.I.E.L.D. is slightly better, thanks to a trio of female characters, lead by Ming-Na Wen, who carries a long and noted history in television, and has developed significant professional capital. Combine that with a writers room that is not headed up by Joss on a daily basis (though he has editorial control over plots), and the formula diverts from his usual. Daisy Johnson and Jemma Simmons have both evolved far past their initial characterizations, and Melinda May has carried some significantly emotional storylines as a departure from her initial stoic façade. And so a pattern emerges. The women in Joss’ properties are not fully realized characters unless they’re being written by other people, but rather objects to tick off boxes. “Hero? Check. Sexual being? Check. Innocent? Check.” It shows in everything he does, though in some cases it has been obfuscated behind the writing or directing of others. This portrayal of women is rather like the Queen on a chess board. She is powerful, yes, but only in a limited form, frequently used in defense of the King. In the past few years, we’ve seen an increasing intolerance for bigoted and misogynistic attitudes within film and media creation. A cast of diverse female characters, as seen in Mad Max: Fury Road, is lauded, while obviously stereotypical writing is panned, as in the recent release, Valerian and the City of a Thousand Planets. As a result, creators have become subtle in their coding: Male characters express superficially feminist views, while taking actions that belie their words – evident in movies such as Passengers. Female characters are placed in apparent positions of power, but are written as social stereotypes. This is parallel to how Joss presents himself: the vocabulary and phrasing of his public statements on women are all organized “correctly.” He says all the right things in press junkets, but his written dialogue and character development put the lie to his words. One cannot separate the art from the person – the art comes from the person, especially when that art is the creation and portrayal of individuals who express opinions and fill theatrical or fictional roles. Dismissing the creator is to ignore the influence that creator carries, especially in regards to the shaping of society. To continue to idolize the art produced by men who have a history of misogyny, without identifying and critiquing that misogyny on a regular basis, is a reinforcement of the cultural biases which already run rampant through our movies and shows. We are fortunate enough to live in an era where the influence of media is becoming well-recognized, and there are occasionally successful attempts to create properties which better portray a diverse and complex society. It behooves us, then, to notice and highlight the properties which falsely do so – they are the most dangerous to an integrated and celebrated society, through their subtle reinforcement of dangerously bigoted tropes. If you’re into storming castles, you’re going to love two of the activities we have planned for Princess Bride day this Saturday! We’ll be demoing two great games, Carcassone (12:30-1:30) and Castles of Burgundy (2:00-5:00). Carcassone is a tile-based board game for 2-5 people. It’s named after a medieval fortified town in Southern France, and players must build out the territory surrounding the city’s famed walls. Connect tiles to build cities, cloisters, fields, and roads, and see who has the most points at the end! Carcassone is very family friendly and great for all ages. Castles of Burgundy is a more challenging and intricate tile-based board game. You and your friends play as competing 15th century princes from the Loire Valley in central France. Through strategic trading, livestock farming, scientific research, and city building, each player aims to make their estate the most prosperous and prominent. The game has five phases of play, during which players collect victory points to win. Because of the many different ways there are to earn points, this game takes careful thought and planning. But because each game can be so different, it stays exciting and fun every time you play it! Princess Bride Day full schedule and menu! The day is almost here! This Saturday 8/12 is Princess Bride day at House Rules. Come in casual garb or your best Princess Bride costume – we hear that masks are terribly comfortable, and that everyone will be wearing them in the near future. We’ll begin at 11:00 AM with a nice game of pin Fezzik to the Cliff. Then from 12:30 -1:30 there’ll be a short game demo of Carcassone, where you can try your hand as a farm boy yourself (check out this blog post for a more detailed description). From 1:30-3:00 you can race your friends to the Cliffs of Insanity, and from 2-5 we’ll be demoing castles of Burgundy. For the grand finale at 5:30, we’ll have a showing of the movie! We have limited space, so remember to call or email us ahead of time to reserve your seats. MLT ($8): Roast beef, lettuce, & tomato on a ciabatta. MLT 2 ($6): Mozzerella, lettuce, & tomato on a ciabatta. The Fezzik ($6): A massive pile of lettuce with cucumbers and tomatoes. Anybody Want a Peanut (Butter)? ($5): Classic peanut butter and jelly sandwich. The Six-Fingered Sandwich ($6): A half-dozen delicate cucumber sandwiches. Iocane Powder ($4): A 16oz bubbly shrub cocktail (non-alcoholic). Twu Wuv Frappe ($9): A 16oz frappe (flavor of your choice) with two straws. Fire Swamp S’mores for 2 ($8): We’ll give you the makings, you toast and build ’em! GLUTEN FREE BREAD has arrived! We are proud to offer delicious, fresh, locally sourced GLUTEN freee bread for sandwiches from Our Daily Bread in Chatham, NY! 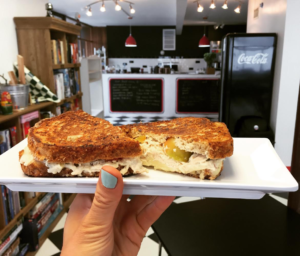 Our celiac staff member Aviva has lamented that there is only one other place in Hudson where one can obtain a good GF sandwich and House Rules Cafe is stepping up to help meet the special diet needs of our community! This seedy wonder grills perfectly for our variety of pressed cheese sandwiches, roast beef, turkey, and as pictured here- tuna 🙂 Stop in and try it for yourself- unlike other more mass produced GF breads, this locally made one does not disappoint! There’s something very comforting and important about morning rituals, and that’s definitely true at House Rules. I work several of the opening shifts throughout the week, which means that I’m rolling out of bed and into the cafe between 6:00 and 6:30 most mornings. When I mention this to people, I tend to get sympathetic cringes in response – but in the months since we opened I’ve come to prefer the early shifts. 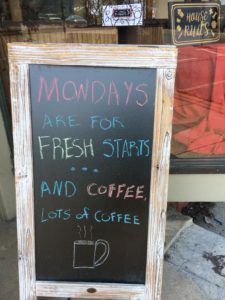 What inspired this blog post was actually the realization last night that I was looking forward to getting up and opening the cafe this morning. Don’t get me wrong, I still have trouble getting myself out of bed some days, but the payoff is good. Going through the morning routine at House Rules is a soothing start to my day. I listen to my favorite morning news show while heating water for coffee and taking stock of the bagels. I turn on all the lights – the way the cafe looks against the backdrop of a gray morning is one of life’s small, inexplicable pleasures. And I’ve discovered that early morning baking is one of the most relaxing things this world has to offer. What better way to start your day than to the smell of coffee beans and brownie batter?